95 GallonTrash Cans have a durable polyethylene construction and withstands subzero cold and extreme summer heat. Great for high traffic areas such as: warehouses, fairs, ball parks, schools, etc. Each container includes two wheels for easy portability. Hinged lip keeps rain out. 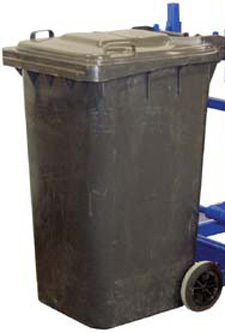 Keep your waste out of eyesight in our heavy duty and easy to move refuse containers. Size 28 1/4" x 34" x 44 1/2".